In ancient writings, the Egg often represented the Initiate: the seeker of Spiritual Light and Truth: the Self and the Soul on its journey. 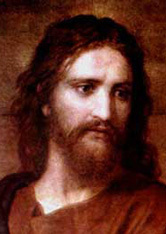 In the picture of Jesus Christ above, whose actual name was Yeshuah, notice that he has been painted as standing inside his own egg shaped Aura. In the Icon of Miryam of Magdala (a.k.a. 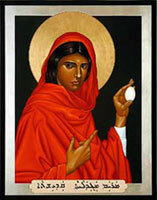 Mary Magdalene) she is holding an Egg. The Egg is also a symbol of birth and nous or gnosis, knowledge and a symbol for the ressurection. In some Ancient teachings the Egg represents the Sun and its field of influence. On the macro-cosmic level: the Sun is the generator of life in our Solar System and we revolve around it in an elliptical pattern similar to an ovoid shape. On one level the Egg represents the Sun and its field of influence throughout the Solar System. The Sun effects our entire Solar System and all within it. In many religions of the world the Sun is a symbol for the miracle and source of all life. 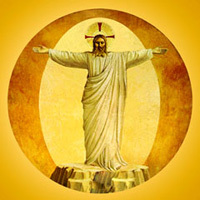 In some spiritual systems the visible Sun and its sphere of influence are equated with the Christ aspect of God. 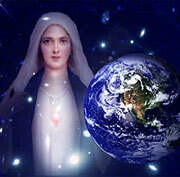 In the Gnostic systems, the Christ is that part of God that can be known that is, light, life, love and intelligence. In the Western Tradition the Sun is recognized as having a part in the greater consciousness. Our world the Earth is a part of that greater consciousness. We tend to name things because of how we associate vibrations and experience. For example, We often call Earth, Mother Earth; this is not because she is actually our Mother, but because we recognize on some level that the life of this Earth has consciousness. We live in a sea of consciousness, the mind of God. We tend to anthropomorphize when we associate with things we can name. My computers name is Max, for example. It has a personality of sorts just as my car has a personality. I call her Jade. God is alive and all around us. Nothing stands still; all moves and has life. The Universe, so to speak, has a personality; it is qualified by the attributes of Life, light, love and intelligence. The Sun and our Solar System are a smaller model of other Suns and Solar Systems within our own galaxy and beyond. The Universe contains billions upon billions of Galaxies and Stars. Our Solar System is but a minute part of that Greater Whole. We may understand to some degree the greater whole by focusing upon the smaller part, our Solar System, as a model. The Sun gives life to everything; without the Sun, we and the Earth could not live. Although our Sun is only a medium sized Star, its influence extends at the least to the outer limits of our Solar System. Notice its influence as we are effected by solar flares and magnetic storms and how the influence of the Sun changes as we move through the seasons. We cannot live without the Sun. Some people say the Sun is the physical body of a being? I do not know, but I do know that this Solar System has a consciousness, just as we have a consciousness. Now what does that mean? If we were to go to Paris or New York or San Francisco, etc., we would experience differences between the cities. What accounts for the differences? The collective mind of the people who live there. San Francisco has a character, Chicago has a character and New York has a character. Paris has a character. The people who come from these places have a character defined by the environment they grew up in. New Yorkers are New Yorkers, etc. So it is with our Solar System; it has a character, and the character is defined by the Sun and its activity. In Western Wisdom Teachings, on a micro-cosmic level, the Sun and the Egg represents the Self and the Soul of the individual. The Egg has a number of parts: the shell, the clear fluid between the shell and the yolk, which has three parts: the outer covering of the yolk, the membrane which gives the yolk shape, and the yellow fluid within the yolk which feeds the fertile embryo at the center of the yolk. In its unbroken state all parts of the egg are centered. The Soul may be imagined as the outer membrane of the yolk of the egg; this sheath gives character or shape to the yolk, the Inner Self of the being; the Soul contains the God within and the other two of its parts. The yellow fluid contained within the membrane, may be seen as representing the Holy Spirit of God. The fertile embryo within this fluid represents the spark of God, the source of the Eternal Light and all Life. The Self and the Soul and the Source are inseparable just as the parts of the yolk are inseparable. The mind of God filters out from the fertile embryo at the center of the yolk through the fluid of the yolk, which represents the Holy Spirit and then this Divine Light filters out through the membrane of the Soul into the world. The clear fluid that surrounds the yolk represents the emanation of the mind and heart of the Soul. The outer hard shell represents the boundary of our personal space or Aura in the Spiritual worlds. As this clear fluid and then the shell surrounds the yolk, our personal spiritual sphere, sometimes called the Aura, surrounds and emanates from the spiritual body into the physical in a space extending about three feet out from the whole of the body. It is an ovoid shape, Egg shaped. People often confuse the Soul and the Ego. The Soul is our innate, inherent personality; it does not change; it is the Logos of who we are; the Soul contains the pattern of our personality; the Soul holds our spiritual DNA so to speak. The Logos may be thought of as the essence of who we are. Just as the essence of a human being's character does not change over a lifetime, so the Soul does not change, but the Soul does change in terms of becoming more aware in terms of conscious. As we progress through life we gain understanding and knowledge and become more conscious. The Ego is the person who we are manifesting in this life. The Ego is only a partial reflection of our true Soul, our personality. The Ego is that to which we give a name such as John, Mary and so on; the Ego is that part of the Soul of which we are conscious you might say. Our true Personality, our Soul is eternal and neither male nor female; our Soul is genderless. Gender is a product of this earthly life experience. On a spiritual level the term feminine is used to represents the passive or receptive side (-) while the masculine (+) represents the active, expressive aspects of the Self and Soul. The receptive aspect may be thought of as the Inner Wisdom. The active aspect may be thought of as the expression of that inner wisdom in manifestation, in creation. The Logos in its advanced state interprets the Inner Wisdom and acts upon it in the world. As we grow, we grow in spiritual understanding and in our ability to create and express our lives in an evermore orderly and productive way. The Tao Symbol to the left is a good visualization for discerning somewhat more clearly how the Soul operates. In pre-Socratic philosophy, the Logos is the principle governing the cosmos; on the human level the Logos of who we are governs human reasoning. The Logos is seen as the source of all activity and generation and is perceived as the power of reason residing in the human Soul. The degree of awareness or consciousness determines how one lives one's life. In Hellenistic Judaism, the Logos is perceived of as the essence of God and is associated with Divine Wisdom and Intelligence. In Saint John's Gospel, the Logos is seen as the creative word of God, as the Son aspect of God and it is taught that this Word was incarnate in Jesus who is also called the Word. It is difficult to imagine that this might be true. How can the totality of Creation be contained within one person on little Planet Earth considering the vastness of creation? In any event, in the Ancient Teachings the Word is Creation made manifest through the life of every Soul. The experience of Gnostics teaches that we are evolving beings acquiring knowledge and advancing in consciousness. As we live and grow in light and wisdom we become more aware and eventually come into union with the Divine Source of All that is. Does that mean we come to contain all that is? No, but it does mean we become aware of our true relationship with God and we may come to know God intimately. This is one of those mysteries that is difficult to explain in words but which may be experienced. 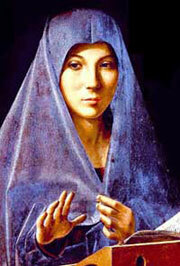 "The Gnostic perceives Jesus and Mary differently than mainstream Christianity. Gnostics perceive Mary and Jesus as great teachers who fulfilled the archetypical patterns of their Souls in this earthly experience; from the Gnostic point of view, Jesus and Mary attained total awareness: enlightenemnt and became one with God. Mary and Jesus are seen as beings who completed their lives here by fully becoming who they were and are, benevolent beings, who ascended to another level or vibration of Greater Light. Some teachings call the place to where they went Heaven. Gnostics teach that Jesus and Mary assimilated the fullness of the Christ Consciousness and came into perfect union with the God within themselves. In the Ancient Teachings the Christ Consciousness is associated with the expanse of the consciousness of the Logos aspect of God, the Son aspect. The pure desire of every Soul who steps upon the Spiritual Path is union with the Divine through taking on ... or you might say ... allowing more and more light to emanate from the Self through the Soul until the Self and the Soul become One Light." Contrary to popular notions, the Ego does not disappear as in extinction, rather the Ego becomes purified and changed as the Soul consciousness becomes more and more present. As we become more conscious of who we really are the Soul actually becomes more conscious and the Soul comes into expression more and more. The Soul is not extinguished; the Soul and the Self are inseparable, eternal. At some point the Ego realizes it is not separate and it apparently disappears because it has become one with the Soul; it merges with the Soul. The Ego realizes it is a Soul and loses its identity. At the same time the Soul assumes its Sonship and a new awareness. This is called Self Realization. The Logos of who we are is made manifest and we become aware we are Sons/Suns of God. Before Self Realization happens, Illumination takes place. Illumination is a result of the process of the Soul's search for Truth. Gradually, the Ego allows more and more light to emanate from the Self as it grows in consciousness. The Illumination is called the Transfiguration in Christianity. The Soul may also seek out a spiritual teacher as it begins to have spiritual experiences it cannot explain. Teachers are those who have gone before. They are travelers along the way who are able to guide others on the Spiritual Path because they are a little further along. They know the Way. Teachers often recommend Spiritual Exercises to assist the student in becoming more conscious and aware. The Auric Egg Exercise is a very ancient exercise and has been used for thousands of years to assist spiritual seekers along the Way. It is a primary exercise for gaining balance and awareness.